Actor Brian Stepanek. Photo Credit: Rich Marchewka Photography. First thing’s first — Brian Stepanek is hilarious. You’d most likely recognize the genial 44-year-old and his brand of comedy from Disney’s hit original series The Suite Life of Zack & Cody. 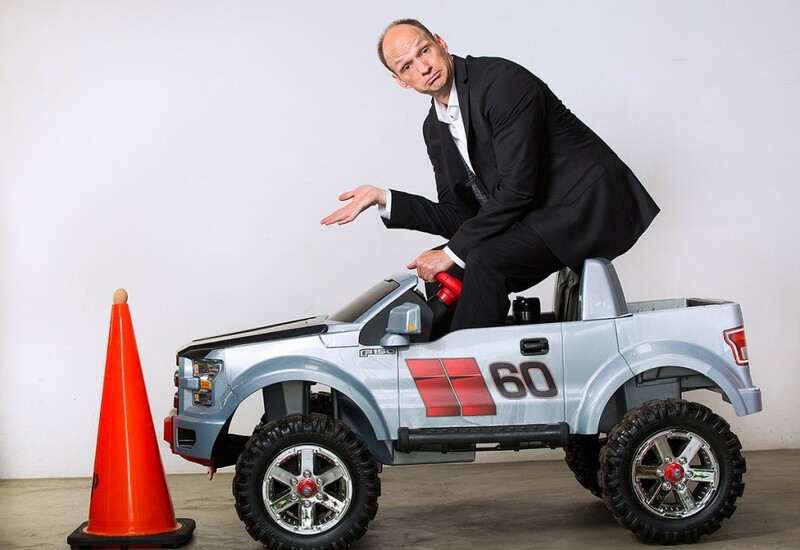 In the show, he played the fan favorite character of Arwin Hawkhauser, Tipton Hotel’s eccentric engineer who regularly found himself in the midst of hijinks with none other than Zack and Cody (Dylan and Cole Sprouse). His career doesn’t start or stop there, however, as he happens to be a man of multiple talents within the worlds of live-action and animation. In fact, Stepanek’s also guest-starred on CBS’ Two and a Half Men, in addition to voicing characters in animated features such as Bolt, The Penguins of Madagascar and Over the Hedge. Recently, the actor lent his affable charm and vocal chops to DreamWorks’ 3D animated feature film, Home. Directed by Tim Johnson (Over the Hedge, Antz), Home tells the story of a young girl named Tip (Rihanna) who goes on an adventure with an alien named Oh (Jim Parsons) to find her mother (as portrayed by Jennifer Lopez) after the Earth’s been conquered by a quirky alien race called the Boov. Their journey only becomes more complicated with the introduction of the Gorg — enemies of the Boov. In Home, Stepanek voices several characters, most notably, the Gorg Commander, and also stars opposite of Steve Martin as well as Matt Jones. With vivid and memorable character designs that pass the benchmark test for cute, Home manages to be a visually spectacular treat packed with outer space explosions and laugh-out-loud humor that the whole family will enjoy. And not to mention the fact that this animated comedy has underlying themes of friendship, acceptance and diversity that will instill important lessons in the leaders of tomorrow. Home smashed box office expectations on its opening weekend as it raked in a total of $54 million, making it the best opening for a DreamWorks animated film since Madagascar 3: Europe’s Most Wanted in 2012. GALO had the pleasure of catching up with Stepanek before the March 27 theatrical release of Home to talk about his roles in the film, the animation industry, other projects he’s worked on and, of course, aliens. GALO: Home tells the story of an alien race known as the Boov, who essentially invade Earth and call it their new home. So I can’t help but start off by asking, are you a believer in the extraterrestrial? Brian Stepanek: [Laughs] Am I a believer in the extraterrestrial? BS: Wow, I’ve never been asked that question. I think the circumstances that would have to happen to create another habitable planet in the universe are very, very, very slim, so I’m going to say no. GALO: Fair enough. So in Home, you voice two characters, Brian and the Gorg. How did you tackle the challenge of voicing two characters while keeping them both distinct entities? BS: Well, first of all, those characters don’t interact with each other, so that’s really helpful — and the second thing is [that] they’re both completely different. The Gorg ended up just being a language of gibberish we played in the booth with until we found the right voice for him. And the Gorg kind of has two forms that he takes, so there’s actually two voices for the Gorg — similar, but different. And then the other character, Brian…I think in the movie they call him Tony? I do about five or six different characters in the movie — the other one is very similar to Jim Parsons’ character [Oh], the kind of stunted English and rearranged English language, which is really fun. The Boov are all about — they’re very non-confrontational, and the thing they’re most proud of is their ability to run away. Of course, [after knowing that], it’s very easy to find the character. GALO: You were originally brought onto the movie to scratch tracks for various characters. But then director Tim Johnson liked your voice so much that he brought you on to play characters in the movie. Was that a first for you? BS: No. You know, I had worked with Tim on a movie called Over the Hedge several years ago, where I came in to voice one of the lead characters before they had cast it and we got to be good friends in that process. I improvised a lot and we worked together quite a bit. And so, ever since [then], he’s kind of brought me in on projects to help out in the development stage, which is what I did with this film as well, not knowing whether I would end up in the film or not at the end. Sometimes, it’s really not up to you. But I was very fortunate in that Tim found some stuff in the movie for me to do. Oh and Tip in DreamWorks’ Home. Photo Credit: Home © 2015 DreamWorks Animation LLC. All Rights Reserved. GALO: Home is a 3D computer animated film, which appears to be the trend for many popular children’s movies today. It’s also interesting, I think, because 3D imitates the physics of reality, but in the end, it’s still more or less actors lending their voices to characters and not so much their bodies, the way you would see if they were acting in-person. How do you go about adding depth and complexity to a character using only your vocals? BS: If you’re lucky, before you do any animation, they can at least show you a drawing of the character. And you can at least see them and see how the mouth is shaped and how the face is shaped — and if you’re really lucky, [you can see] how it moves; a lot of times, the directors and animators can explain to you how that character moves and that really, really helps. If they’re a quick-moving character — I always think of Steve Carell in Over the Hedge (that squirrel that he played), and [he] knew that was going to be a hyperactive, crazy, fast squirrel and he adapted his voice to it. So I think that helps a lot, when you get a lot of information up-front. And then, as you start to vocalize the character and act them out, you find them. You know, the director is like, “oh, I like that” or “I never thought of that,” maybe if [the actor] has a little lisp or some kind of tick that will lend itself to that animation. GALO: And have you ever found yourself working on a project where you went in and you didn’t have that initial character sketch? BS: I do cartoons for TV. Occasionally, though, you come in — a lot of times for TV shows, you come in groups, so the whole cast will be there, which in movies, you typically do not have. When the whole cast is there, you have your main, regular characters and they’ll audition you right there in the room for a new character, because you can voice up to three characters in an episode. So a lot of times, they’ll be like, “all right, this is a delivery guy.” You have no idea what he looks like or anything and you just throw out a voice — and if they like it, then they’ll say, “all right, that’s the guy.” And then they’ll animate to your voice, rather than you animating to the character. GALO: Wow, I never knew that. BS: Yeah, it’s kind of a neat process. It’s kind of the reverse of how they do films. It’s probably a time thing. GALO: So, have you read Adam Rex’s The True Meaning of Smekday, the novel that Home is based on? BS: I have never read that book. ← You Asked, Sweet Suspense Answered!